Left: An image of our Sun taken by NASA’s Solar Dynamics Observatory, showing million-degree plasma being channelled into loop-like shapes by the immense magnetic fields. Right: A zoom-in of the highly magnetic region of the Sun’s corona studied by Dr. David Jess and colleagues from Queen’s University Belfast, Northern Ireland. Image credit: Queen’s University Belfast. Solar flares are massive explosions of energy in the Sun’s atmosphere. Experts have warned that even a single ‘monster’ solar flare could cause up to $2 trillion worth of damage on Earth, including the loss of satellites and electricity grids, as well the potential knock-on dangers to human life and health. A key goal of the $300 million Daniel K Inouye Solar Telescope (DKIST), which will be the largest solar telescope in the world when construction is finished in 2019 on the Pacific island of Maui, is the measurement of magnetic fields in the outer regions of the Sun’s atmosphere. The technique pioneered by the Queen’s-led team, just published in the journal Nature Physics, will feed into the DKIST project, as well as allowing greater advance warning of potentially devastating space storms. 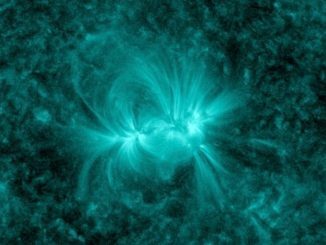 The new technique allows changes in the Sun’s magnetic fields, which drive the initiation of solar flares, to be monitored up to ten times faster than previous methods. The Queen’s-led team, which spans academics from universities in Europe, the Asia-Pacific and the USA, harnessed data from both NASA’s premier space-based telescope (the Solar Dynamics Observatory), and the ROSA multi-camera system, which was designed at Queen’s University Belfast, using detectors made by Northern Ireland company Andor Technology. Lead researcher Dr David Jess from Queen’s Astrophysics Research Centre said: “Continual outbursts from our Sun, in the form of solar flares and associated space weather, represent the potentially destructive nature of our nearest star. Our new techniques demonstrate a novel way of probing the Sun’s outermost magnetic fields, providing scientists worldwide with a new approach to examine, and ultimately understand, the precursors responsible for destructive space weather. The Moon will pass in front of the Sun on 9 March 2016 UT, casting its shadow over much of Southeast Asia. 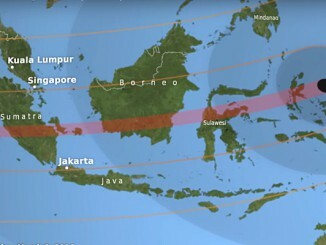 The path of totality, in which all of the Sun’s bright face is blocked by the Moon, is nearly 100 miles wide as it crosses Indonesia, while the partial phases can be seen from East Asia, Australia and the Pacific Ocean. Here is our detailed guide. NASA’s Solar Dynamics Observatory routinely sends back stunning images of the sun, including this view of a currently active region showing a tapestry of magnetic field lines shining in ultraviolet light. A detailed study of young stars and their surroundings has produced dramatic new evidence about how multiple-star systems form and how the dusty discs that are the raw material for planets grow around young stars. 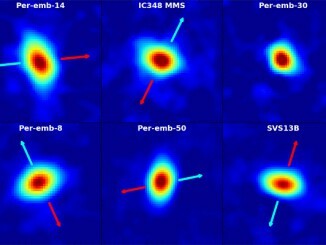 Scientists used the Very Large Array (VLA) radio telescope to study nearly 100 newborn stars in a cloud of gas and dust about 750 light-years from Earth.